I'm quite sure many this side of the border would agree, although I think from their standpoint it's mainly a patriotic thing. I've always hoped that somehow Canadian utility player Peter Orr would end up in a Jay uniform. It really doesn't have anything to do with him being Canadian either. I grew up playing with Pete. He was the shortstop on our high school team in Newmarket, I was the second baseman. We had an amazing team, and Pete was our cornerstone. I played with and against some pretty amazing ball players, and Pete was hands down the best of any of them. So I wasn't surprised when he was selected (during a regular day at school) by the Texas Rangers in the 39th round back in 1998. To my knowledge he is the only one, out of all the people I've ever playing with or against, that ever had a taste of the big leagues. Though he didn't actually play for the Rangers, he signed as a free agent with the Braves in 1999. 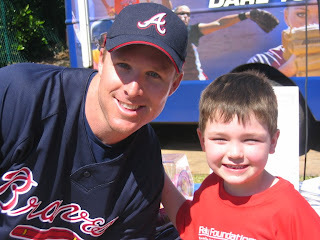 He played several seasons in the minors for the Braves before he landed a spot on the roster after a solid spring training prior to the 2005 season. He was mainly a utility guy, playing a multitude of positions & acting as a pinch hitter/runner and defensive sub. He never got a real chance to play as he was behind guys like Rafael Furcal, Brian Giles, Chipper Jones and Jeff Francoeur just to name a few. Pete played on the 2004 Canadian Olympic team that finished 4th and he won the 2004 Bill Lucas Award for the Atlanta Braves Minor Leaguer best exemplifying Sportsmanship and Character. Those who know or have met Pete wouldn't be surprised by this one bit. For all his talent and accomplishments Pete remains to this day one of the classiest guys I've ever met. I doubt there was a nicer, more humble guy in the entire Braves organization and I consider myself lucky to have played with him. Pete was designated for assignment by the Braves after last season and subsequently released. However, he was signed to a minor league contract by the Nationals in December and was a non-roster invitee to Spring Training. I've always believed that given a chance to play everyday, he could develop into a solid two-way player in the Majors. He was one of the last guys cut at spring training by the Nationals yesterday after an amazing spring, which saw him hit .389. The Nationals decided to keep another utility player, Willie Harris, instead. Pete is starting the year down in AAA Columbus. Hopefully, he keeps his strong play going down in Columbus and gets a nod sometime this season, as I know he could bring not only a fantastic and winning attitude to the National roster, but intangibles and effort that would be an asset to the club. Most of us who knew or played with him growing up follow his career with great interest, wherever he may be playing and will continue to do so. If I was general manager of the Jays for a day, I'd put together a deal to get Orr on the roster here in Toronto. I'm sure it wishful thinking, and extremely bias on my part, but in this case I really don't care.